Sunday, February 24, 2019 | This annual event sponsored by the Music Undergraduate Involvement Committee (M.U.S.I.C.) will take place in Mixon Hall to celebrate the 50th anniversary of the Joint Music Program between CWRU and CIM. 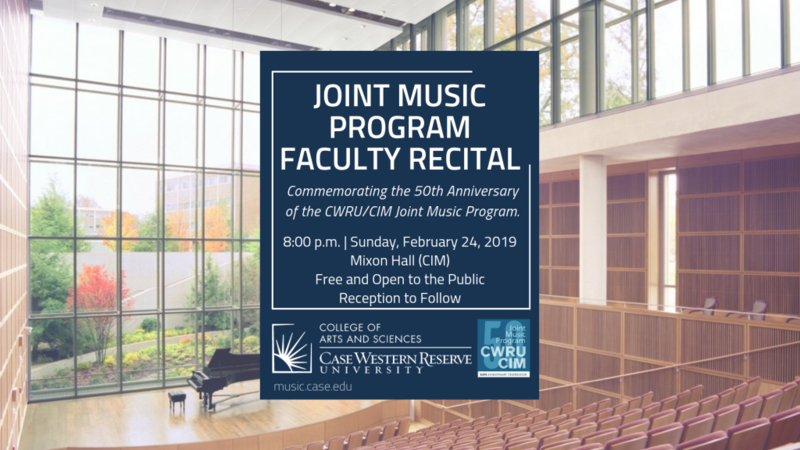 The program begins at 8:00 p.m., and features several of our JMP faculty members, including: Paul Ferguson (trombone), Gerardo Teissonnière (piano), Cynthia Watson (oboe), Meghan Guegold (horn), Stephen Sims (violin), Loren Toplitz (trumpet), Steven Greenman (violin), Sean Schulze (piano), Eric Charnofsky (piano), and more! Click here for more information and directions.